Any good college student knows that pizza is what gets you through long study nights, and leftover pizza is what keeps you going between classes. However, any good poor college student knows that it’s way too expensive to order out all the time. Over the last year or so, I’ve experiment with a lot of crust recipes, and finally, after months of searching and trying and waiting for things to rise, I found my perfect crust recipe! It makes about 2-ish medium sized pizzas. I usually just take a blob and roll it out and leave the rest to roll out the next day for a quick lunch. I like this one because it’s a really nice thin crust that’s still chewy under the cheese, and it has no rising time, which is a plus for a hungry person at the end of the day. Mix the yeast and the water. Let it sit for about ten minutes, until a little bit bubbly. Measure salt and flour together. Pour in water and mix. Knead until incorporated (about five minutes or so). A lunchtime personal size pizza! ime than I would spend sitting around on the couch waiting for the delivery guy anyway. I like how in the picture, my cookie sheet looks nice and aged and rustic. Sadly, I did just buy it last semester (my previous cookie sheet was ruined by a previous roommate who turned on a burner underneath it when it was sitting on the stove). 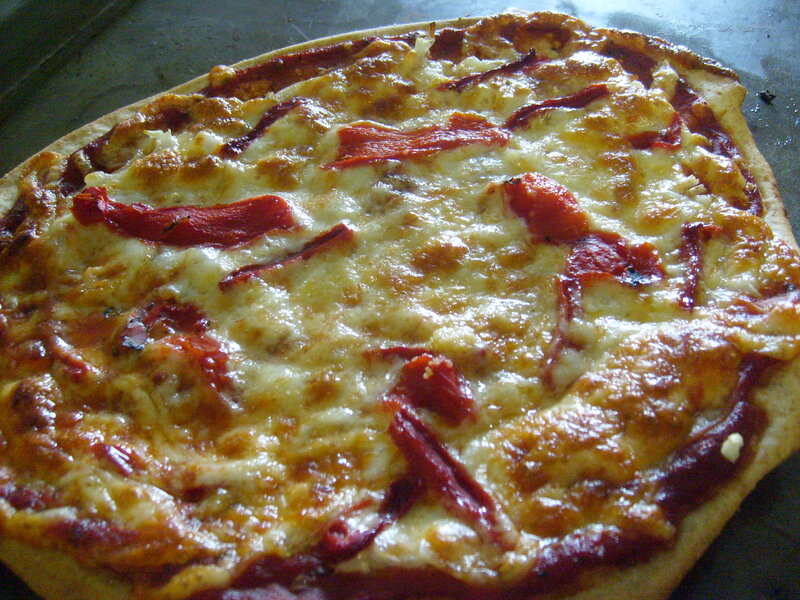 And now, I make pizza! After experiencing some quite delicious homemade chocolates while in Denmark, I decided I should give it a try, starting out with a very simple truffle. I decided to seize one Saturday, and after searching multitudes of truffle recipes online, I decided to just mix them all together and go with a very basic chocolate. As a beginning blogger, I tend to forget the camera at each step, especially the most important steps as this is when I tend to freak out about things that aren’t melting, cooling, firming, or gelling as they’re supposed to. So, I apologize again for the lack of photographs. I’m still learning. 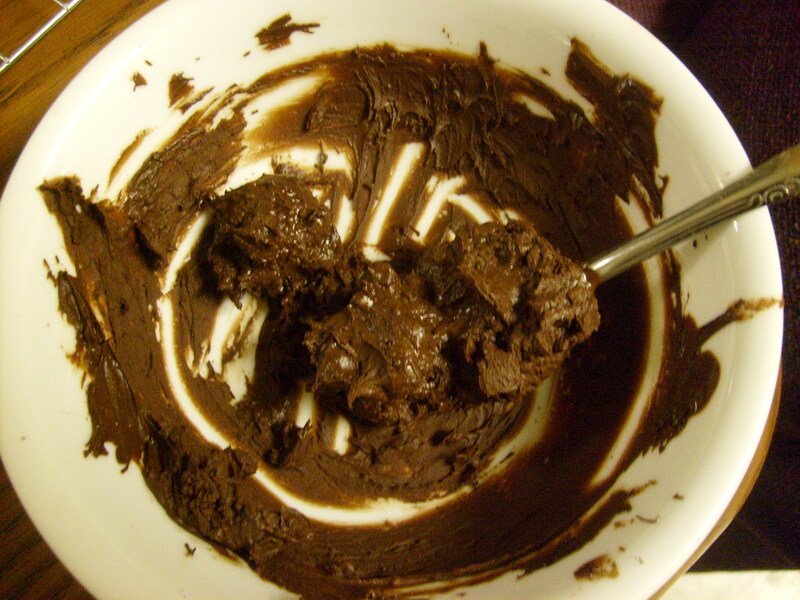 Cocoa powder, melted chocolate chips, and white chocolate chips for coating. Scald the heavy cream (bring to an *almost* boil). Pour over the chocolate chips, and let stand for a few minutes. Then stir gently until smooth. Put bowl in the refrigerator and let the ganache firm up overnight or over a long shift at work. 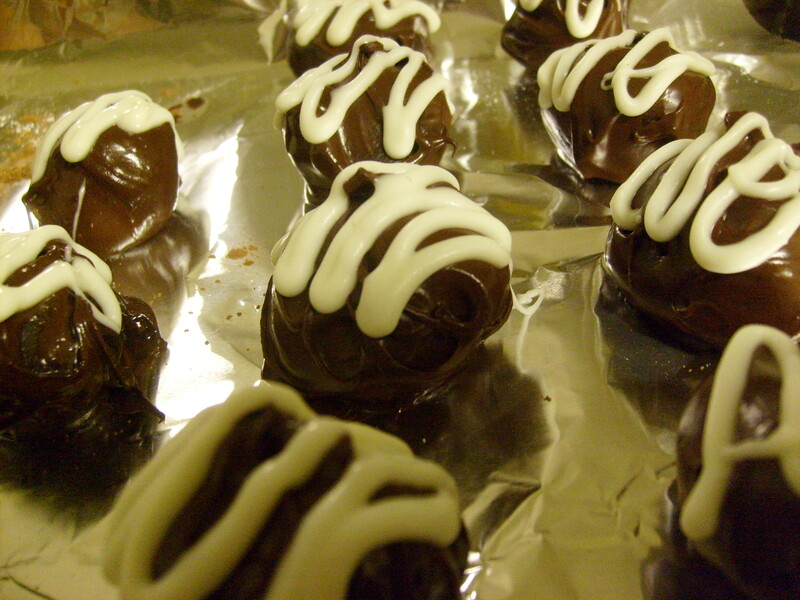 Take the ganache out and roll it into small balls (whatever size you please, really). 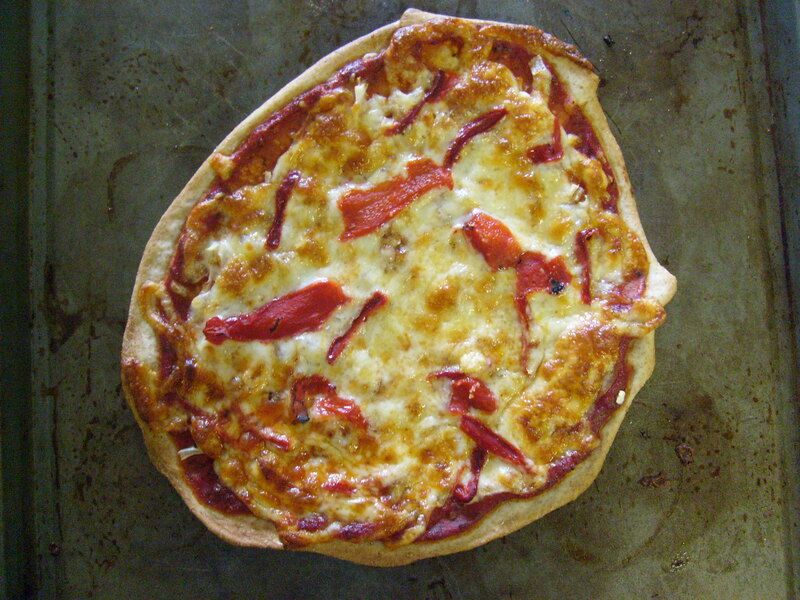 Set on a foil or parchment-paper lined baking sheet. Put back into the fridge for a few hours. When they’re firm again, roll them in cocoa powder (I found this to be easiest, but when you bite into the truffles, it leaves the bitterness on your tongue, which I personally don’t like. Also, the cocoa powder flies everywhere while you eat and makes you look even more piggish), or coat them in melted chocolate chips and drizzle with melted white chocolate. It was my first chocolate seizing incident, and made me quite sad, seeing as all the chocolate got all hard and chunky. 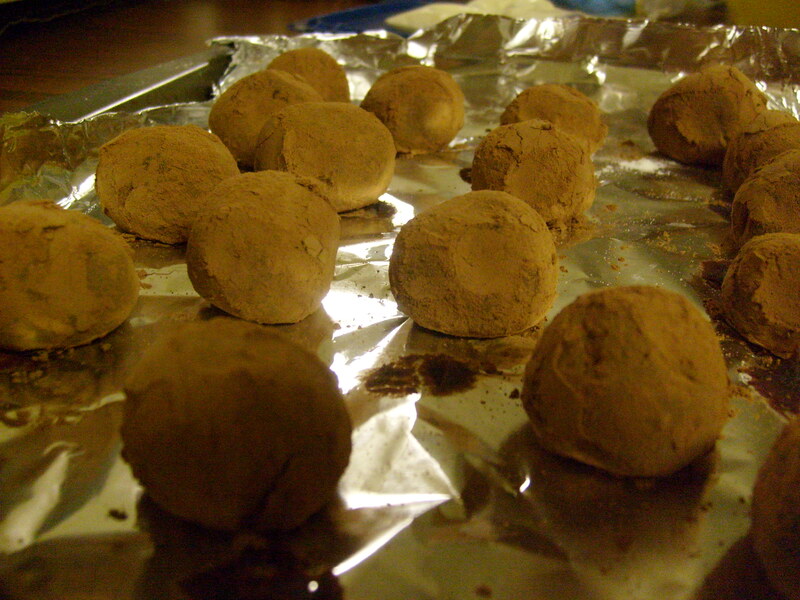 But not all that sad, considering that I had about 30 truffles in the fridge. Surprisingly good for how simple they were to make, I was pleased with my first chocolate adventure, and plan to dabble further in the field. Some other day.